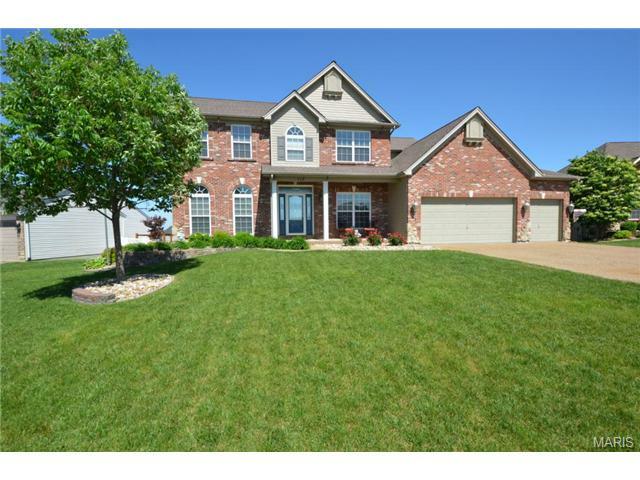 Located in St. Charles County real estate, homes for sale in Wentzville MO are located close to I-70 leading into St. Louis County/City. Wentzville Real Estate is made up of both residential and commercial properties and offers numerous dining and shopping options. Wentzville MO Real Estate and Wentzville MO properties are a perfect addition to the St. Louis Real Estate market. Wentzville MO real estate has an average home age of 15 years. Homes for sale in Wentzville MO range in price from $75,000 to $700,000. The median home price in 2014 was approximately $208,000. Wentzville Mo homes are conveniently located at the intersection of I-70 and I 64/40 providing quick access to all areas of St. Louis. Wentzville has been ranked as one of the quickest growing cities in Missouri. Wentzville is a premier location for both residences and businesses while keeping a friendly small town feel. Wentzville properties are served by the Wentzville School District. See Great Schools for up to date ranking on every school in the area. If you are looking for a home for sale in Wentzville MO or you would be interested in buying a home in Wentzville, please contact St. Charles real estate expert, Sharon Colona and St. Louis Realty for a professional and simple buying or selling process. Call (636) 397-7653 or email at scolona@stlouisrealty.net. Wonderful setting for this beautiful horse boarding and training facility on 28 acres adjoining Busch Conservation Area and across the road from Broemmelseik County park with it's equestrian trails. The 200' x 144' 40 stall, heated and insulated barn has a 190' x 72' indoor riding arena. The 350' x 225' outdoor riding arena has an all weather footing. Up to 6 turnout pastures. All fencing is vinyl coated and electrified. No barbed wire. xD; xA;The main home is a custom built 1 1/2 story, 4 bed, 4.5 bath executive home with a large kitchen featuring custom 42 cabinets, quartz countertops, glass tile backsplash, stainless appliances, and more. A 4 season sunroom is just off the kitchen and a gazebo waits for you on the patio outside. Step out onto the front covered porch and relax with a beautiful view of the stocked 3 acre lake. xD; xA;Also, 3 bed, 2 bath caretaker home with an oversized detached garage/workshop and pole barn. Plus, a 3 bed, 2 bath trailer for ranch hands. Magnificent estate home situated on over 4 acres with expansive views and inviting lavish entertaining inside and out. Grand two story entry with stunning staircase opens to the two story great room with wood floors, fireplace and wall of windows. Impressive showroom quality chef x2019;s kitchen features high end appliances, granite, endless walk-in pantry, prep sink and custom tile backsplash. Adjacent are the hearth and breakfast rooms boasting reverse wood vault making this the space everyone wants to gather. Spacious master suite features luxurious bath with walk-in shower, stately soaking tub and dual walk-in closets with washer and dryer. Upstairs are four additional bedrooms with loft. The lower level is free flowing with large entertaining spaces, screening room, temperature controlled wine storage, private exercise room and full bath. The lush, manicured yard welcomes guests with a salt water pool, fireplace, covered and open seating areas, and BBQ area. If you are looking for a BREATHTAKING ESTATE, within 15 minutes of Augusta-Wine-Country and 40 minutes of downtown St. Louis, you have found your personal OASIS. This home looks like a CASTLE, but warmly welcomes you home every single time. Built in 2013 you have access to all the MODERN amenities you would expect, from the espresso cabinets and glass-tiled shower to the touch-activated faucets; but are also embraced by the OLD-WORLD jumbo brick and custom light fixtures. This home provides pure perfection as a backdrop for the bonfires and roasts, as well as the holiday gatherings and wine tastings. This STUNNING property weaves together all that life has to offer so that you don x2019;t have to choose between them. When should we look for you? You deserve this! Enjoy the fruits of our labor as you relax in serene, peaceful surroundings with panoramic views of your own stocked lake and rolling hills. The view is park like and extremely private whether your inside looking out, or nestled around the custom fire pit watching the sunset and listening to the soft sounds of nature and your very own fountain. No traffic noise here! inside are all the extra you'd expect and in impeccable condition. A recent professionally finished walkout lower level of custom tile work and bar, temp controlled wine room, hearth room, theatre rm, family rm, game rm and bath make a complete package to fulfill your every dream. Lighted stone columns greet you as you turn in, while the brick and stone exterior and lush landscape create fabulous curb appeal. Every step you take will just get better and better! The overall floor plan is very open and bright and all d xE9;cor is tastefully neutral. MOTIVATED SELLERS! Beautiful, custom-stacked stone & brick home w/over 7000 sq ft of space & on Now over 6 acres of land. No subdivision, No Restrictions ~ Surrounded by light woods, overlooking rolling hills & ponds, country right outside of town! xD; xA;Featuring a Gourmet kitchen with granite counter tops, 42 custom cabinets, 5-burner gas-range center island, double ovens, & stainless steel appliances, beautiful tiled & wood flooring, custom woodwork & archways throughout, a spacious great room w/vaulted ceilings & fireplace overlooking the sweeping farm land & in-ground pool - separate dining, office, bonus room & a 4 car garage w/heated flooring. Master suite is loaded w/coffered ceilings, fireplace & luxury bath w/a whirlpool tub & the spacious rec room has an additional fireplace & wet bar which walks out to the huge patio, pool & custom built waterfall. Lots of storage space, 3 efficient water heaters & a dual HVAC system! An entertainers dream as well as an escape to paradise! Stunning 2 story on 3 acres offering BREATHTAKING views! With over 5,800 of finished sq ft in this 5 bed, 6 bath home, you will be blown away. Main floor boasts hand-scraped HW floors, gourmet kitchen w/ custom 42 cabinets, granite, tile back splash & custom walk-in pantry, DR w/tray ceilings, den w/built in shelving, GR complete w/gas FP & wet bar & spacious hearth room offering FP & patio access. The expansive Master Suite 800+ sq ft of luxury w/plenty of windows, huge walk-in closet w/custom closet system, his and her vanities, tub w/ FP view, walk-in shower w/custom tile work & dual shower heads. 3 addt. BR on upper level, each w/private bath. Also on the second level, loft area w/family room. The W/O LL offers a wet bar & rec area along w/addl bed/bath. The backyard is spectacular w/in-ground pool, large pool deck and spacious fenced yard backing to trees, it's your own private oasis! Minutes from HWY 61 and all conveniences Wentzville has to offer. Horses welcome. A rare find! MAJESTIC 1.5 story home on 3.29 acres! Drive up to your own estate! Home is GORGEOUS. Walk through the grand entrance on the Italian porcelain foyer floor & look up to your 20 foot wall of windows surrounding the living room gas fp. OH BUT the kitchen is to die for! SS appliances, double oven, gas stove, granite countertops, custom 42 cabinets, breakfast bar, prep sink AND wine cooler! Walk through the kitchen you will see an exquisite hearth room that is warm & inviting with a wb fireplace. Off the hearth room is a BRAND NEW four season room. This is just 1 of 3+ porches/decks that cascade across the back of the home. On the other side of main floor is the master bdrm & en suite. Master suite has access to another covered deck that overlooks the expansive view. MFL & half bath finish off main floor. Upstairs are 3 generous sized bdrms, 2 share a jack n jill bath and 1 has it's own suite! LL has bdrm, full bath, media room, office & fully screened porch! NEW DRIVEWAY GOING IN! Magnificent Estate on 7 Private acres in Wentzville. Nestled in the woods this Stunning Brick Ranch has what you have been waiting for! One Owner, Unincorporated-No Restrictions. Over 2900 sqft with Finished Walk out basement and oversized 2 car garage, Brick Carriage House with addl 2 car garage, Shop area w/ an Upstairs. Open Concept Gourmet Mission style Kitchen, Dining and Hearth Rooms addition is TOP OF THE LINE. Spacious Family room w/2nd Fireplace! Finished Lower level is Built to entertain-offers Media Room, Secret Wine Cellar hidden behind a bookcase, Rec Room, 2nd kitchen, full bath, office/den and Plenty of storage! Possible in-law quarters! Attention to detail at every turn! Updated Bathrooms, Gleaming Hardwood floors, Gorgeous Pond, Private back yard, Dual HVAC, You have arrived! Don x2019;t miss this amazing Opportunity! Custom built 4,200 sq.ft. of living space inside this amazing home. 2 story full brick & stone exterior, 3 car finished garage, geothermal system, 2 built in surround systems, 2 kitchens, 5 bedrooms, 4.5 baths, MFL, main floor master walk in closets, hardwood floors, gas fireplace, formal dining. Main floor kitchen features custom built cabinets, stainless appliances, center island, large walk in pantry. Enjoy the covered screened in composite deck. Main floor master w/walk in closet, his & her sinks, tub w/separate shower. Upstairs: large loft area, office, 3 bedrooms, 2 baths. Downstairs: 5th bedroom, full bath, 2nd kitchen, 2nd family room, & storage. State of the art water heaters, walkout & patio. Sitting on 5 private acres m/l at the end of a dead end blacktop road. Scattered trees, partial fencing. Improvements include shop w/concrete floor, 2 sliding doors & electric w/lean to. 2nd building open sided & unique old barn w/hand hued log timbers. Only 10 minutes from Wentzville. GORGEOUS Former EAST HAMPTON Woods LOMBARDO DISPLAY.LOADED w/SPECIAL FEATURES&PREMIUM Options.EXTERIOR features:*SIDE entry FINISHED garage w/WORKBENCH*CUSTOM Landscaping*HOLIDAY Light PACKAGE*BRICK&STONE Elevation*LEADED Glass FRONT Door w/SIDELIGHTS*IRRIGATION*.610 ACRE Lot*COVERED deck w/CEILING fan*RECESSED lighting*BUILT in SPEAKERS&Aggregate Patio.DESIGNER interior features:*CHEF's Kitchen has STAGGERED custom CABINETRY w/CROWN Molding*Pot FILLER*GLASS Backsplash*DBL Ovens*APRON Sink*ENORMOUS Island*CUSTOM Lighting*RANGE hood*5 BURNER GAS Cooktop*WALK IN Pantry*CUBBIES*DROP Zone Cabinets*MFL w/SINK&CABINETRY*SOHO LOW Voltage Package w/Smart Home TECHNOLOGY for Surround SOUND/MEDIA&WIFI*CUSTOM Paint Package&MILLWORK*SPLIT Bdrm FLoor PLAN*4 BDRMS+OFFICE*FRENCH Doors*BAY Windows*ARCH Package*WALK In Closets in EVERY Bdrm*NEW Carpet*DESIGNER HIGH Traffic CARPET to FINISHED LOWER Level*LL Kitchen*Both Refrigerators to STAY*9FT POUR*POWDER Room*TOO many FEatures to List!! Exquisite 4 Bedroom, 4 Bath ranch with walk-out basement and six cars of garage space on a 1 acre lot. Entering this home you are greeted by a barrel ceiling entry, soaring 11 x2019; ceiling and warm wood flooring carrying you by the separate dining room into the living room with a cozy gas burning fireplace. Continuing on through hearth room you will find the spacious kitchen featuring beautiful 42 x201D; cabinets, granite counters, gas cook top, double oven, pendant lights and a center island. Next you see the breakfast area and, through the windows, the composite deck and rear yard. A large master bedroom suite and bath with a double head rain shower, jetted soaking tub, bonus room, two bedrooms, full bath, half bath, laundry and mud room complete this level. Down the atrium staircase is a massive space, wet bar and 9 x2019; ceilings leading to a patio with a hot tub/spa. A bedroom, full bath and storage complete the lower level. A 3 car detached garage and 3 car attached garage complete this home. NEW CONSTRUCTION by Fischer and Frichtel in the highly desirable Wyndgate Oaks neighborhood! Features inc 3 BD, 2.5 BA, 2,661 s/f, .38 AC lot, 9 x2019; clngs w/12 x2019; in the Grt Rm, frml DR, Study, gas FP, wr iron stair balusters, granite c-tops, huge island w/brkfst bar, st steel appl, gas c-top, dbl ovens, range hood, 42 x201D; cab, roll out trays, soft close doors-drawers, glass tile b-splash, U/cab lighting, hardwood floors, 5.25 base, cust wall paint, Luxury Mstr Bath w/free standing tub-sep vanities-W/I shower-granite vanity tops, R 50 ceiling insul, 50 gal water htr & 9 x2019; bsmt pour. The ext is elegant w/brick, arch shingles, gar coach lights, 18x14 patio, 3 car gar w/opener-keyless entry, insul carriage style gar doors & full yard sod. This amenity-packed neighborhood has over 50 AC of wooded common ground, pool, bathhouse, parks, sports court, 3 AC lake & trails for walking-biking. Excellent location near shopping, restaurants, recreation, Hwy N, 40, 364 & Chesterfield Valley. MOVE IN READY! Absolutely beautiful home TO BE BUILT. Visit our display in the neighborhood for a glimpse of what this beauty will be!! Awesome stone and brick front with fully sodded yard- GREAT CURB APPEAL!!! This home backs to trees. the back yard will feature a retaining wall to help level the area and give some usable space. The main floor features a split design 3 bedrooms, 2 1/2 baths, hardwoods and ceramic tile, generous allowances allow you to pick custom cabinetry and granite tops, select your own flooring! 3 piece crown molding in all common areas and separate dining room give this home an elegant feel. A screened in covered deck will allow for relaxing on those summer evenings. The finished walkout lower level will have an additional bedroom, a full bathroom and a great entertainment area. Pictures are of our display - visit our display at 119 Pinewood Trails Dr - then visit the lot! xD; xA;Several other floor plans available and we are custom builders so we welcome your ideas! Incredible Ranch backs to the 10th hole Fairway on Bear Creek Golf Course, walking distance to clubhouse! This home is the ultimate in entertaining Spacious Great Rm w/floor to ceiling Stone Gas Fireplace,13ft wall of windows to view your private backyard, w/a built-in Salt Water Pool! Hardwood flooring thru-out, flows into the unique dining rm w/octagon shaped 12ft ceiling opens to Hearth rm w/brick fireplace! Gourmet Kitchen w/42in maple cabinets,Granite tops, raised breakfast bar, back splash, SS app breakfast rm & walk-in pantry! New Paint & Carpet in Bedrms. Huge Master Suite w/ high coffered ceiling,his & her walk-in closets, luxury bath w/his & her sinks, corner tub & separate shower! Finished bonus rm over 3-car side entry garage a great area for the kids! two additional bedrms w/Jack & Jill bath, finished basement, rec rm, sleeping area w/full bath & back storage. Professionally Landscaped fenced in pool area w/retractable awning,In-ground sprinkler sys.Home Warranty Included! Great opportunity to build the Cutler model on a 2 acre lot - plenty of trees! Or build one of our other plans or we can help customize plans with you! The Cutler offers 3 bedrooms and 2 and 1/2 baths inside and a brick and stone front elevation that is absolutely beautiful! Stop by our display at 119 Pinewood Trails Dr for more info! Brand new Lombardo-built 2-story slated for May completion filled with spectacular features, including 9' main level ceilings & wood floors! Chef's kitchen with granite counters, breakfast bar island, soft-close cabinets, walk-in pantry & stainless steel appliances, including a gas cooktop & range hood, is open to the great room with a gas fireplace & plentiful windows. Private office with French doors & a dining room. Jaw-dropping master suite with a private sitting room, 2 walk-in closets & bath with seated tiled shower, soaking tub & dual sinks. Each spacious family bedroom has its own private bath access & a walk-in closet. Handy 2nd floor laundry. Finished lower level rec room & bath with a 9' pour. Family garage entry with a cubbie bench & walk-in closet to store your gear. Irrigated yard with an oversized patio & firepit. 3-car garage. Zoned HVAC. Wentzville (Timberland) Schools. Beautiful neighborhood with lots of amenities nearby. Lombardo quality throughout! See it today! Fall in love with the modern elegance of this 1.5 story from your 1st step into the expansive open floor plan w/ 12' ceilings. The distinctive kitchen will stun w/ granite countertops, stainless steel appliances (including double wall ovens), subway tile backsplash & 42 cabinets w/ pull out shelves! Spacious family room has cozy gas fireplace. 1st floor master has 9' ceilings, 2 walk in closets & luxurious private bath with double sinks, separate tub & seated shower. 3 bedrooms upstairs w/ bonus loft area. All bedrooms have walk in closets. 2nd bedroom has en suite bath. 4th bedroom has built-in cabinetry perfect for office or craft room! Finished lower level has something for everyone...media room, rec room w/ wet bar, exercise room & 5th bedroom! Bathroom has quartz sink & tile surround shower all hidden w/ charming rolling barn door. Corner lot is beautifully landscaped w/ patio & built in fire pit! 4 car garage! Easy access to I-70. Wentzville (Timberland) Schools. See it today!